This sign states that those with tattoos (as well as gangster) are not welcomed at this establishment. 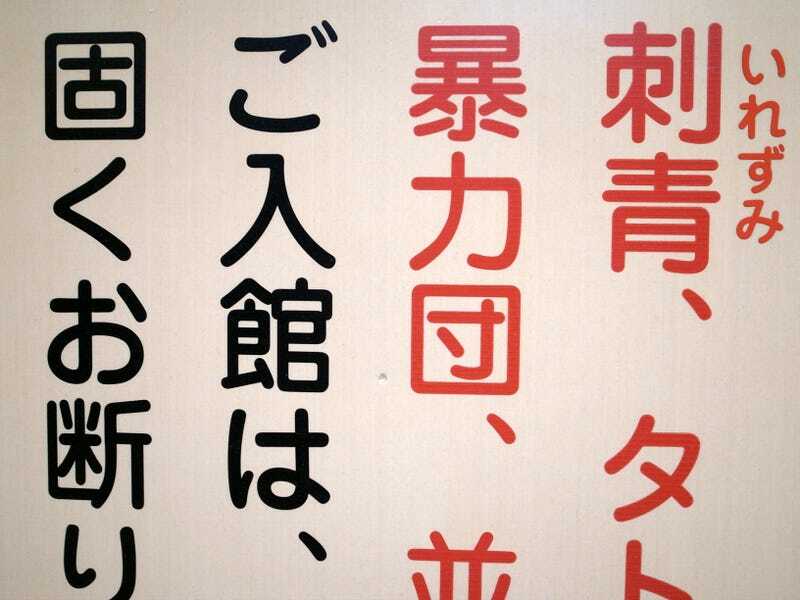 In Japan, many hot springs, public pools, sports clubs and hotels will not allow guests with permanent ink. A new website helps those with tattoos find welcoming establishments. Other sites like this already exist, but what makes Tattoo-Friendly.jp worth mentioning is that it also has an English language search option. The site lists onsen (hot springs), sento (public baths), gyms, hotels, inns, pools and beaches that don’t shun those with tattoos. There are several reasons for this [stigma]. One is the previously mentioned associations with organized crime. Another, however, is less obvious and is rooted in the Japanese subconscious. Currently, the site has over 600 listings across the country. Hopefully, that number will increase.